In a rematch of last year’s Spring championship, the Rays captured their first Spring title by sweeping the two-time defending champion White Sox by scores of 19-1 and 15-4 in the best-of-three series. 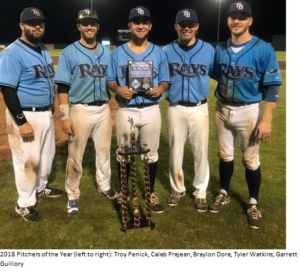 The Rays, who have won the last two Fall titles, finally broke through to earn the elusive Spring title for the first time. The sweep capped-off the first undefeated Spring season in league history, as the Rays went 12-0 in the regular season under manager Tyler Watkins. 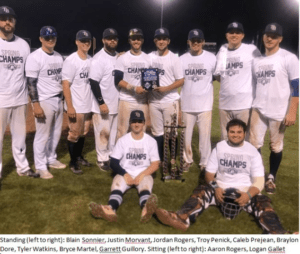 The White Sox finished 8-4 in the regular season and advanced to their 5th consecutive Spring Championship Series under manager Mike Guidry. In Game 1, the Rays’ bats got off to a hot start as they batted around in the first inning and plated 10 runs. Caleb Prejean got things started with a lead-off single and scored on an RBI double by Watkins. Two batters later, cleanup hitter Bryce Martel blasted a two-run home run to left field to give the Rays a quick 3-0 lead. That would prove to be all the runs the Rays needed, although they would go on to score 16 more runs, highlighted by separate 3-RBI doubles by Watkins and RBI league-leader Garrett Guillory. All nine batters reached base safely for the Rays, with eight recording at least one hit. Rays shortstop Jordan Rogers finished the game 4 for 4, while his cousin, Aaron Rogers, went 0 for 0 but scored three runs and reached base all four times with three walks and a HBP. On the mound, the Rays were led by pitcher Braylon Dore, who went the distance. Dore scattered five hits, struck out five, walked one, and hit a batter. Dore was able to keep White Sox center fielder and League MVP Chad Jimenez hitless. The White Sox only run came on an RBI single by eight-year veteran Jonathan Borque that scored newcomer Bryce Brandon in the 2ndinning. The White Sox struggled on the mound, but newcomer Kam Heiser halted the Rays’bats by recording a perfect inning in the 5th. In Game 2, the White Sox kept things close until starting pitcher Brandon Guidry was chased from the game in the 6th inning. The Rays again got off to a quick start, as the first two hitters, Prejean and Watkins, both scored in the top of the 1st to give the Rays a 2-0 lead. White Sox pitcher Guidry was able to settle in and hold the Rays scoreless for the next three innings, allowing the White Sox to tie the game with a run in the 3rd and a run in the 4th. In the top of the 5th, the Rays broke the 2-2 tie with three runs off Guidry, highlighted by a clutch two-out, two-RBI single by Troy Penick. In the bottom of the 5th, the White Sox answered again with a run from an RBI single by Heiser off Rays pitcher Dore, who entered the game after starter Watkins completed the first four innings. Entering the 6th, the Rays led 5-3, and the game felt nothing like Game 1. However, that all changed when the Rays plated five runs in the 6thto take a commanding 10-3 lead and never looked back. The Rays would score another five in the 9th, highlighted by a three-run home run to right field by manager Watkins. Offensively, the Rays were led by multi-hit games from Prejean, Watkins, Guillory, and Blain Sonnier. On the mound, the Rays displayed their pitching depth, using five pitchers who split the regular season Pitcher of the Year Award. Watkins threw the first four innings to get the win, followed by two key innings from Game 1 winner Dore, and an inning each from Penick, Prejean, and Guillory. For the White Sox, pitcher Guidry was great for the first five innings. Left hander Noland McGuffey, another newcomer for the White Sox, kept the Rays off balance for 1.2 innings. Offensively, the White Sox were led by Heiser, who went 1 for 3 with two RBI. League MVP Jimenez went 1 for 3 with a HBP. Watkins was the Championship Series MVP. At the plate, he went 6 for 9 with two doubles, a homerun, 10 RBI, one walk, and one HBP. On the mound, he was the winning pitcher in Game 2, throwing four innings, allowing two runs (one earned), on three hits, three walks, and one strikeout. As mentioned, the regular season League MVP went to White Sox center fielder Chad Jimenez. In the regular season, Jimenez hit an incredible 0.704 AVG with a 0.775 OBP, seven doubles, a triple, and a home run. He also scored 16 runs and recorded 13 RBI.